Burns Night Banger is a culmination of a 12 month feast of music making all to raise funds for Parkinsons UK. Funds raised so far are almost at the £5000 mark. This has all been achieved by local artists giving up their time and performing all over the place and waiving their fee. The evening is hosted by BillySpakemon. Billy Spakemon is a Black Country Treasure! His stories, poems and songs move, captivate and titilate in equal measure. His stories, poems and songs are all about the blood, sweat and tears of the real folk who worked and built the Black Country. Local Singer / songwriter, Acoustic musician. Heartfelt Lyricist. 5 piece tribute playing 100% live covers of Madness tunes plus some 80’s floor fillers in a Madness style. Complete 2 Tone / Ska celebration. 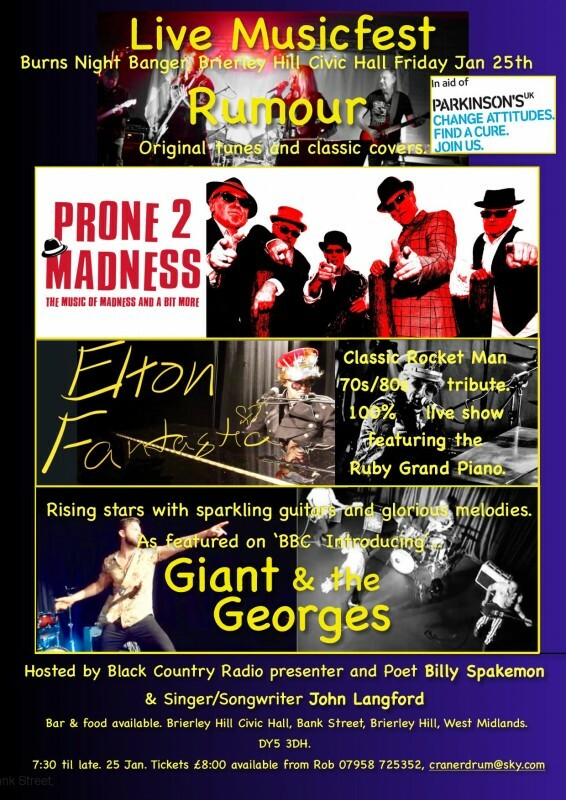 Classic Rocket Man 70s/80s tribute featuring the Hits, the costumes and the Ruby Grand Piano. Including: Goodbye Yellow Brick Road, Rocket Man, Saturday Night’s Alright (for Fightin’), I’m Still Standin’, and tons more. All played and performed live -Elton will perform solo and with a full band. Look out for surprises. Zingy hook lines, tangy riffs and vocal harmonies sweeter than honey. By combining their eclectic range of influences, Giant and the Georges have created an electrifying fusion that is guaranteed to captivate any audience (terms and conditions apply). 4 piece band featuring Liz on vocals and Pete on Guitars. An eclectic mix of classic covers and cool original guitar based songs. Rumour have worked tirelessly over the last couple of years to build up a strong following all over the UK and abroad. Other Artists to be announced! Doors Open at 7pm with the first band expected on stage at 8pm. **As there are still to be acts confirmed the time the event is set to end has not yet been finalised so please ignore the 10.30pm stated finish.